You guys. It’s that time of year. The time where I have a complete and total melt down because….I’m getting older. *insert grandma emoji-eye cringing emoji-crying emoji* Yes, it’s true, my birthday is this coming Saturday, and, as with every birthday, I can’t believe it’s here. Like, how has it already been a full year??! I mean, shouldn’t it still be April of last year?! I just don’t know if I can handle giving up the 25-30 age range check-box on forms quite yet (I mean, do you think people will even know if I just keep checking it anyways?!). All joking aside, there are plenty of perks to getting older. You start to focus more on how you feel and less on your age. You realize that age is truly just a number…and who really uses numbers past 30 anyways? You learn to care more about what’s actually important (like your real friends) and less about what isn’t (like eating a whole pint of ice cream in one sitting, not that I’ve done that or anything). You get to enjoy the finer things in life, like nice trips and good wine, and you get to invest in timeless classics, like good bags and good china. Case in point, the beautiful cup and saucer from Herend that you can see in some of the pictures below. Each hand-crafted porcelain piece is full of history (read about their fascinating story here) and truly a beauty to behold, a worthy investment once you’re 30+. Speaking of 30+, did I also mention that one of the great things about getting older is you can actually enjoy your birthday cake? Like you can actually have a full piece and savor every bite without having a total meltdown that you’ll never ever possibly fit into your pants again. 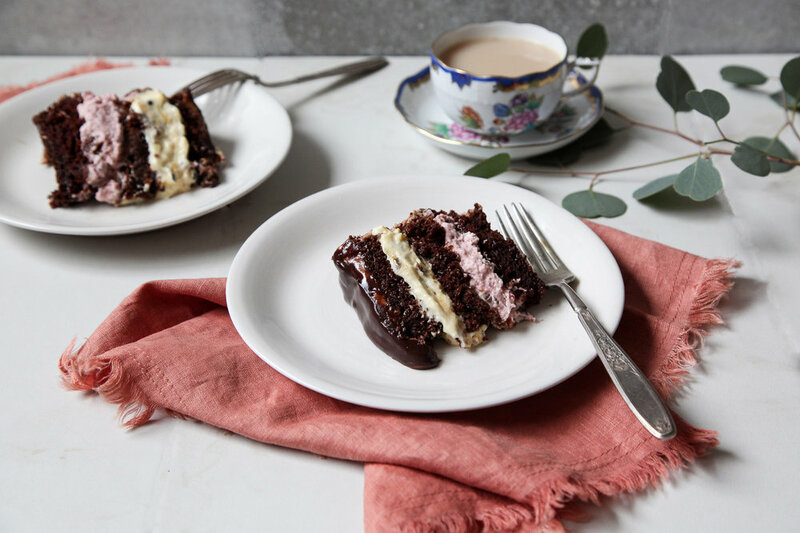 Which is a good thing, because who would want to miss out on cakes like this chocolate passion fruit and raspberry cake? I can 1000% say not me. I mean, chocolate, yes. Raspberry, yes, yes. Passion fruit...YES,YES,YES! I’d gladly give up a jean size just to eat this cake because it’s worth it. Ohhhh, and, I also made it in mini size, because duh! Everything is better when it’s mini, right?! 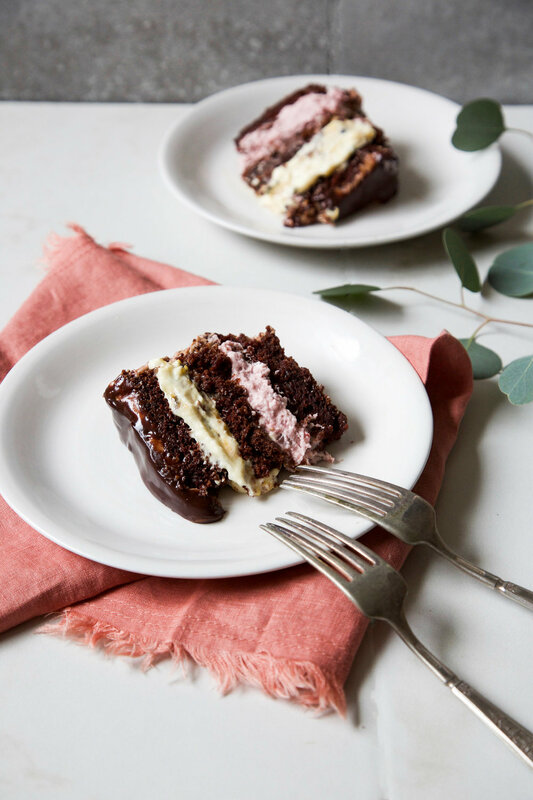 I used the cake recipe from my no-fail chocolate cake to make the base, simply baking it in mini cake pans (just make sure to adjust the baking time to about 20 minutes), but the rest of this insanely delicious cake recipe can be found below. Also, I’d love to know- what’s your favorite cake to have for your birthday? Do you have the same thing every year? Do you like to switch it up? Or, do you not even have cake at all? Let me know in the comments below. To make the mousse: In a small bowl, stir together the gelatin and water. Set aside. In the bowl of a stand mixer, beat the heavy cream, on medium speed, until fluffy. Add in the sugar, vanilla and gelatin mixture, and beat for a few more seconds, making sure not to let the cream get too stiff. Divide evenly between two bowls. Add one kind of jam to each bowl, and use a spatula to gently fold the jam and cream together. Refrigerate for about 30 minutes. To make the frosting: In the bowl of a stand mixer, cream the butter on medium speed. Add in the melted chocolate and one cup of the powdered sugar. Beat until fully incorporated, then add in the remaining sugar and 2 tablespoons of milk/cream. Continue mixing, adding more milk/cream until you reach your desired consistency and the frosting is smooth and creamy. Set aside. To make the ganache: Place the chocolate in a small, microwave-safe bowl. Microwave for 30 seconds, then stop to stir. Continue microwaving for 15-30 more seconds, or until the chocolate is fully melted. Begin adding the cream, a few tablespoons at a time, until you reach a consistency that is sufficient for drizzling. Allow the mixture to cool slightly. To assemble the cake: Place one cake on a serving dish/cake stand. Spread the top with raspberry mousse (I only used about half the mixture.). Place the second cake on top and spread that with the passion fruit mousse (Again, I only used about half the mixture.). Place the cake in the refrigerator and allow to chill for about 30 minutes. 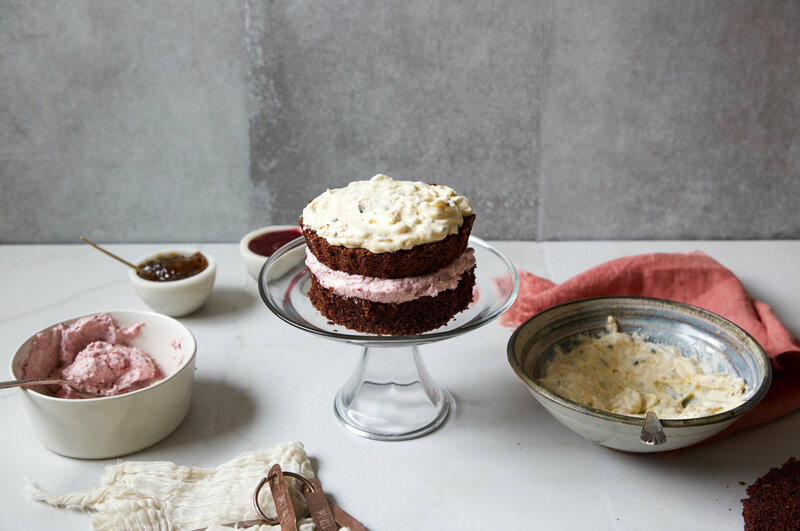 Frost the cake with the chocolate butter cream, then chill for another 30 minutes. 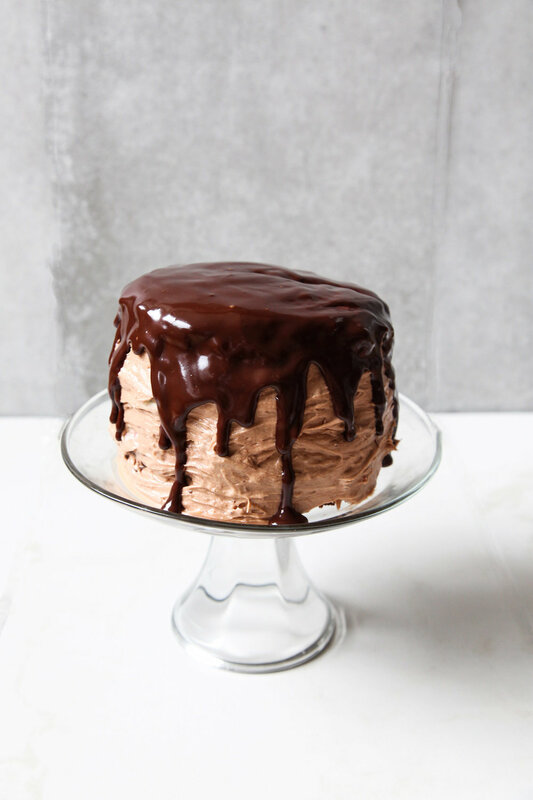 Drizzle with the chocolate ganache. Allow to chill again, for at least 30 minutes (and up to several hours), before slicing and serving. Store leftovers in an airtight container in the refrigerator for up to 2 days (if it actually lasts that long!). For the cake recipe, I used my no-fail chocolate cake, found here. Just remember to bake it in smaller pans and adjust the baking time down to about 20 minutes, or until a tooth pick inserted in the center comes out clean.